Monthly payments have a very similar setup as a one time payment schedule. 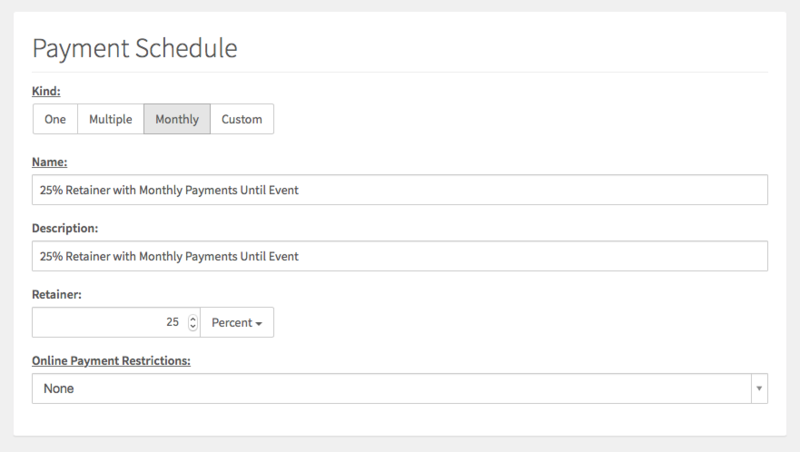 When creating a new schedule, you’ll choose Monthly in the Kind option and fill in your payment schedule name and a description for your reference. The main difference with a monthly schedule compared to a one time payment is that you can set a Retainer to be due at the time of booking, although this is not required. Below is an example of a monthly payment schedule that is requiring a retainer of 25% of the order’s total due up front, with the remaining balance to be split into the monthly payments. Note on Retainers: If you are requiring a retainer to be paid at the time of booking, you set that in the Retainer option in your payment schedule only. You should NOT also add a separate payment for the same amount using the “New Payment” button. This will cause your client to be prompted for twice as much as your retainer on the booking date. If this payment schedule is applied to an order, Táve will automatically divide up the remaining balance and schedule the individual payment due dates on a monthly basis beginning exactly one month from the job booking date, and the final payment will be due no later than 1 month before the job date. If the balance doesn’t break down exactly even, any remaining overage will be reflected in the final payment in the schedule.